......click on the post title to see one of the hotties singing at the CMA Festival. I am more of a rock an roll fan but country music has the best looking women singers IMHO. ......that reminds me. How the heck did Philly get stuck with a former New York Football Petunia aka Giant as one of our local TV sportscasters?? Plus the guy is pretty horrible- he is the new mold of sportscaster. That means he talks loud , waves his hands and arms theatrically and gives you the local scores only. I remember when the sports guy actually had some broadcasting skills so they gave him sufficient time to provide a quick rundown on all the pro scores (in season natch). To be fair to this ex-Petunia, the local sports time slot has been reduced in favor of 2 or 3 weather spots. They seem to think Americans are big pussies because they try to scare the crap out of you every time there is a thunderstorm or snow flurry in the forecast. Little League World Series Final is on ABC right now. Great game, it's now 3-3 in the bottom of the 4th inning. Teams are China/ Taepei (is that Red China) vs. Chula Vista, California [near San Diego]. [FYI - this picture was from the International Final played yesterday between China and Mexico.] Gotta get up there to see a game one of these years. .....how much is that domain name worth alone? The Phila Inquirer and Daily News are on the auction block. The Inquirer sells about 300,000-350,000 copies a day while the Daily News sells about 150,000. If you started a business from scratch and also owned this domain name in an MSA with 7-8 million people and two newspapers that drive annual revenue of $120-$150 Million or so, what is that worth? In my business (M&A world), you have to peg or assume a profit rate. Let's use 15% for the sake of argument. That is profit of maybe $20 Million. Ergo this is a potentially sweet business. I could make this combination work and I don't know squat about the newspaper business except it tends to be run by folks who have problems with capitalism and profit [for examples see Chis Scatullo and Zack Stalberg]. They generally have a million excuses for why they don't have any [profit]. .....after this one because I have to do 176 posts a year per my parole agreement. That's what about 27 a month over the last four months. Can of corn. Or Piece of cake. .....and I bet you won't read that in your local newspaper. I estimate newspapers get 40-50% of their total revenue from ad revenue. The rest comes from reader subscription fees. But a 29% drop in half of a business' revenue is enormous. Most businesses would not be able to survive without significant changes to their business model. Lastly, how much more red ink can the media spill? Before they stop putting a happy face on this economy in an effort to save the Obama economic team which has failed so far bigtime! SAN FRANCISCO (AP) -- Newspapers' financial woes worsened in the second quarter as advertising sales shrank by 29 percent, leaving publishers with $2.8 billion less revenue than they had at the same time last year. It's the deepest downturn yet during a three-year free fall in advertising revenue -- newspapers' main source of income. The magnitude of the industry's advertising losses have intensified in each of the last 12 quarters..........Still, the statistics served as a stark reminder of the crisis facing newspapers as they try to cope with a brutal recession and advertising trends that have shifted more marketing dollars to the Internet............the latest turbulence left U.S. newspapers with ad sales of $6.8 billion in this year's second quarter compared to $9.6 billion last year......through the first half of the year, newspaper ad revenue plunged 29 percent to $13.4 billion....."When the economy eventually begins its recovery, advertisers will return to spending, and newspapers will find themselves extremely well positioned to harness the strength of their print and digital platforms to build a brighter future," Strum predicted. .......Industry analyst Ken Doctor of Outsell Inc. isn't as confident. In a report released earlier this week, Doctor predicted newspapers won't recover all the advertising revenue that has evaporated during the past three years because be believes the recession accounted for only half of the decline. The other half of the equation represents ad spending that has permanently migrated to less expensive options on the Internet, Doctor said......Even newspapers' Internet advertising suffered in the second quarter. The industry's online ad revenue totaled $653 million, a 16 percent drop from last year. Anyhow, til the other night when Texas beat Chula Vista, I thought ChulaVista was unbeatable. Shows you how much I know. What a great country! Right now Chula Vista leads Georgia team 5-4.......scratch that Georgia rallied and now Georgia is ahead 9-5 in the 4th inning. .....sure call me an SOB. And keep this in mind. The average American does not worship nor love the Kennedy family. Democrats should consider that before they try to organize a faux rally around the myth of Ted Kennedy in the quest for health care reform. But Dems are far too dumb and too arrogant to listen to my advice. For that I am very grateful. ......Ted Kennedy. I offer my condolences to his surviving family and friends. But let's be honest about a well-known public figure. When he was a 37 year old, married, U.S. Senator, he was responsible for a car accident where he left a young woman behind to suffocate at the bottom of a pond while he saved himself and went to sleep off a huge drunken hangover. 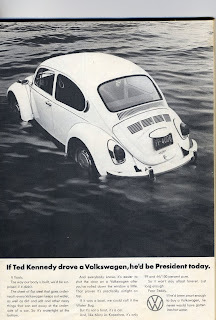 If he had any class or true remorse, Ted Kennedy would have withdrawn from his public life as a senator. He would have spent the rest of his life doing meaningful volunteer work. But no , Ted Kennedy craved the spotlight and power so he stayed in the senate. He was hypocritical as well. For example, in 1974, Ted Kennedy berated Prez Ford for pardoning Nixon. Kennedy asked if there were two types of justice in America and one was reserved for the connected and powerful! [did he actually say this with a straight face]. I think it is outrageously funny when his kids say "Dad worked so hard". What did a fat drunk know about hard work? IMO, Ted Kennedy was a huge embarrsassment to most thinking Irish-Americans, Catholics and the hard-working taxpayers of America. I hope Massachusetts replaces Kennedy with a senator who has actually held a real job in their life. There are enough limousine liberals in Congress already. We don't need anymore like Ted Kennedy. .........like when the boss's smart but inexperienced son-in-law gets a promotion he did not deserve? Many of us have seen this before. A young, connected employee is elevated to a position for which he is not really qualified. Most observers will patiently watch while the greenhorn makes mistakes. Sometimes he learns from his mistakes and due to his innate talent and intellect, he can grow into the job. Is Obama learning on-the-job? Will he learn from mistakes he has made like letting far-left liberal Congress critters write a lousy, ineffective Stimulus plan? The answer is it remains to be seen. But I would bet Obama is too arrogant to learn new tricks and lacks the common sense and humility to tuly change so he will continue to flounder. He will go down in history as an ineffective president and poor leader. Is it just me, or did we have a similar headline on this very Web site Friday morning? Except instead of Coughlin and Giants, it said Reid and Eagles. The G-Men AKA PETUNIAS lost to the Bears, 17-3, last night and Tom Coughlin wasn't pleased with the way his team performed. "Quite frankly, we got embarrassed," he said, per Mike Garafolo of The Newark Star-Ledger. "I don't like that word: 'flat,'" he added. "(The players are) professional athletes. I question their focus. ... There isn't one phase that I thought played well. I didn't think we were very physical at all. We came in with some solid physical objectives and things we didn't do from the first week we had to improve upon. We really didn't accomplish any of those." The Giants had several players sidelined also, plus they just played Monday night and had only two practices in between games. The one newsworthy item from the game is that defensive tackle Jay Alford, a Penn State product, suffered what is initially being termed an MCL sprain. Per Garafolo, Alford will undergo an MRI and other tests today. ......is a far left liberal true believer. Rep. Joe Sestak, a democrat representing a suburban Philly district, is a regular Kool Aid drinker. His positions can be easily predicted- he supports whatever the far left believes. It is kinda surprising for a Naval Academy grad and former Navy Admiral but not unprecedented. For example, I give you Jimmy Carter. "The bill mandates that individuals purchase insurance with limited exceptions. Government would beresponsible for ensuring that every American has access to quality health insurance by providing subsidies to qualifying low- and middle-income families....yada yada yada". Blogger's comment: I recommend freedom-loving Americans un-elect Congress critters like Joe Sestak. I disagree with his policies vehemently but have respect for Joe Sestak, the veteran. ........the man must be on speed. I have posted 176 comments per year in each of the last four years. Now that has become my standard goal. I will make 176 again this year even though Iam behind that pace bigtime. .....woof woof is the new Eagles fight song. 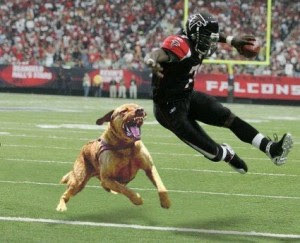 The Iggles signed Michael Vick and hopefully will also get rid of their crappy, longtime theme song called "Fly Eagles Fly". IMHO. Expect weekly protests from those PETA idiots. ............if we un-elected every Congress critter who has been there ten years or more and we un-elected every Congress critter who was newer but was part of a political dynasty such as Casey, Carnahan, Tsongas, Sarbanes, Murkowski, Landrieu, any Kennedy relative, Biden (his son soon to be anointed U.S. Senator), HOW MANY PEOPLE WOULD WE BE THROWING OUT OF CONGRESS OUT OF THE TOTAL OF 535? I bet it would be more than 50%! Maybe it's time we did that, huh? It seems the tide is turning against so-called "non-partisan" groups like AARP and so-called "balanced" media like NPR`. I own the domain name www.notaarp.com and I guess there should be a way someone could make money from that domain name right? I just don't have the time to figure it out. As Don Corleone would say, make me an offer I can't refuse. ..........and after I pass the bar exam, I plan to specialize in representing all those dumb Philosophy majors who chose that useless major and are now doomed to work ar Target or Borders or Starbucks. I bet I can make a killing. There must be tens of thousands of people who majored in philosophy or tree-hugging or communications and made their parents pay $100,000 in tuition to get a worthless degree. I bet the rate of alcoholism and drug use is way higher among those parents than the general population. Well, no wonder- their kid was smart enough to go to college but dumb enough to major in a useless subject. Click here to read a story where a student is suing her dear old alma mater cause she can't find a job. .........Contrary to the beliefs and actions of the Obama administration [especially with regards to their ill-conceived Stimulus Plan], the laws of economics and of human nature have not been repealed. The evidence is now pretty much irrefutable. My theorem is as follows: When you offer Americans a product at a big frigging discount, they will want and buy more of that something. My evidence: The hoards of paying customers who crowded into car dealers to buy cars when the govt offers a substantial discount aka $4,500 smackeroos! Actually, this is really not news to anyone outside the Obama administration. So once the plan goes through, I will make up a new identity to get free healthcare. Does that make me a bad person? .......so far so good. He had a one-hit shutout thru seven innings tonight in his debut as a new starting pitcher for the Phils versus the SF Giants. And he gave up two hits and one run in the eighth inning. So far so good! Bring on the Damn Yankees.